Last Sunday is now well behind us, but despite a busy week, I don’t want to miss the opportunity to comment on its rich readings. The Second Sunday of Easter taught us about God’s mercy for us; the Third Sunday taught us to worship; this Fourth Sunday, Good Shepherd Sunday, taught us about union. 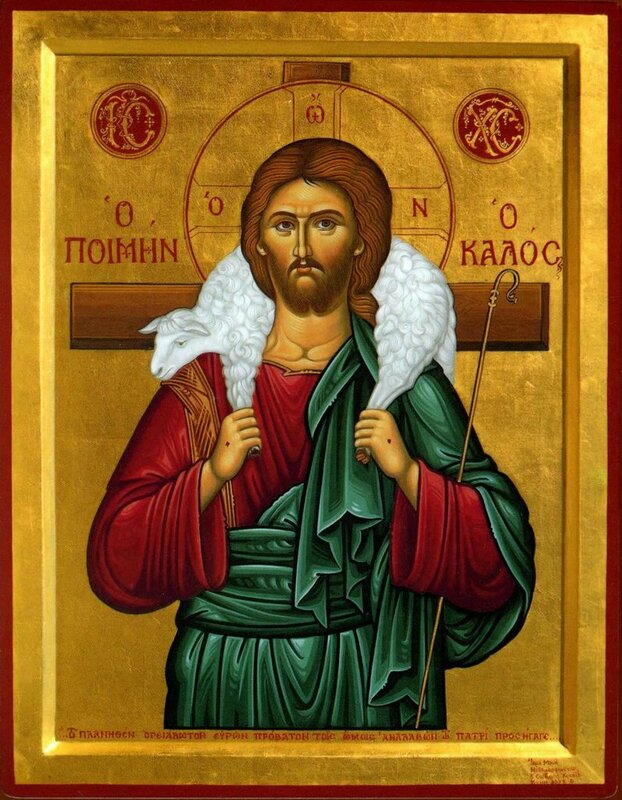 The short Gospel reading was from the fabulous tenth chapter of John’s Gospel, which is all about the Good Shepherd. Pope Francis says a good shepherd smells like his sheep. Jesus, the Good Shepherd, is one with his sheep. He shares in our humanity so that we might share in his divinity. Our reading begins, “My sheep hear my voice; I know them, and they follow me.” What is implicit is that, just as he knows them, so they know him – that’s why they recognize his voice, and follow. Sheep, as we have said in the past, have an important kind of intelligence: they know their shepherd. They don’t have to be driven with sticks; they follow. Faith is a gift – we recognize our shepherd because he has given his own knowledge to us. They know him because he is among them. They trust him because he knows and cares for them. The shepherd and the sheep are one. He gives them life, his life – and they will never be destroyed. The earthly shepherd is a dim image of the kind of care that our Good Shepherd gives us. He is the very giver of life. We live in his hands. And then he concludes (in our little snippet from a long discourse), “The Father and I are one.” He alludes to a deeper discussion about the unity of the Trinity, a unity poured into our hearts by the Holy Spirit, who is given to us. In our reading from Revelation, in a more mystical key, John portrays the shepherd as a sheep – the most vulnerable sheep, the Lamb. Of course, Jesus is the Lamb in John’s Gospel, too, but here we have it put together: “the Lamb will shepherd them, and lead them to springs of life-giving water.” He can shepherd us because he has united himself to us. We can trust him because this Lamb shows his concern for us in becoming one of us. When he offers us shelter from the sun and the heat, and relief from our hunger and thirst, we know it is for real. We look to Jesus in his humanity and know he will care for us. The Lamb, of course, is also an image of sacrifice. In Revelation he is “the Lamb who was slain.” In this reading, we wash our robes and make them white in the blood of the Lamb. There are two kinds of depth of unity in this remarkable phrase. First, he unites himself to us not only in our relief, but in our suffering. He loves us “to the end,” to the depths, to the most awful aspects of our existence, to blood and death. And second, he washes us white, which is a sign of purifying us. He makes us good. He doesn’t merely shelter us from the outside, he transforms us from within. He is not merely a distant God who gives us earthly food, he is Jesus who transfigures us, makes our hearts like unto his Sacred Heart, washes us clean. In our reading from Acts, these mystical images were made concrete and historical. Paul and Barnabas are missionaries. At this point they are in Syria, the northeast corner of the Mediterranean. The Lord who has united himself to them speaks through them. He has given them his word and they become his mouthpiece. Paul and Barnabas “spoke to them and urged them to remain faithful to the grace of God.” It is Paul and Barnabas who speak, but it is Christ’s word, calling the people to Christ. Christ who has united himself to them unites them to himself. And he sends them to suffer as he suffered. They are rejected by their people – Christ’s people. They are expelled from the territory, and shake the dust from their feet. And in being rejected with Christ, they are filled with joy and the Holy Spirit – the joy of the Holy Spirit, joy of Christ’s love, poured into their hearts. The Lamb who shepherds them has made them shepherds. He who loves us calls us to love. Christ who has come to us makes us part of him, rejoicing with him in the Father, suffering with him for the sheep. Christ calling you. How does he want to take flesh in your life this week? Last week – the second Sunday of Easter, Divine Mercy Sunday – the Church focused on Mercy. This week our readings turn us to worship. Worship is the positive to the slightly negative side of mercy. Mercy comes in where something is lacking. But God’s mercy, by strengthening us in our weakness, allows us to worship – and God’s awesome mercy becomes a new reason for worship. One of the great joys of the post-Vatican II revised Lectionary is that, beside the traditional readings from Acts of the Apostles and John’s Gospel, we now also get a taste of the Revelation, or Apocalypse, of St. John. There are various ways to read this book. Protestants sometimes get into trying to predict the future. The Catholic tradition tends not to comment on the book too much – but isn’t into soothsaying. (Jesus said no one knows the day nor the hour, not “just decode the Bible.”) There’s a modern movement (by ex-Protestant Catholics) to turn this book into code for the liturgy. Probably closer to the mark, but I don’t know if it’s necessary. Literally, “revelation” (in Latin) or “apocalypse” (the same word in Greek) means “pulling back the veil,” seeing what’s hidden. It’s not the future that St. John’s Apocalypse “reveals,” but the present – the spiritual battle that rages all around us. It is a great joy when we learn to read this book, and so to see through the veils to spiritual realities. This is not soothsaying. This is the song at the heart of every true Christian. This is worship. Let us discover it. There is no other scene in the Bible that so brilliantly shows what worship means. Little children understand the story. Peter is so delighted to see Jesus that he turns to foolishness. Worship is not foolish, but there we have the heart of Christianity – deeper maybe, even, then the discovery of God’s mercy. To be so in love with Jesus as to put on your clothes and dive into the water. Then they ate a meal with Jesus. There are several meals, but this one on the beach is the most touching. Just to be with him. This is why we go to adoration, what we’re really doing when we pray the rosary, the heart of everything: just to be with him. “Yes, Lord, you know that I love you.” The threefold repetition, of course, overcomes Peter’s threefold denial. But let us not over-complicate things. The heart of worship is simply the repetition of love. That’s what worship means. Everything else comes back to adoration, profound love of Jesus and of the Father, nothing else. And the reading from Acts of the Apostles takes us a step deeper into the same spirit. On the one hand, we have suffering. “We must obey God rather than men.” And so they had to “suffer dishonor for the sake of the name.” To love him is to be willing to suffer. Yes, suffering. Yes, obedience. But deeper than that is their joy in savoring the name of Jesus. The name, which is not a talisman, not a magic word, not an obligation, but the simple savoring of the goodness of God. Oh, sweet Jesus! Where is worship in your life? The Sunday after Easter is Divine Mercy Sunday, a new feast created by St. John Paul II, in response to a call by St. Faustina Kowalska. It is a wonderful feast – but it takes some unpacking. It should be said, first, that feasts do not come from one visionary alone. Take the Sacred Heart. People associate devotion to the Sacred Heart with St. Margaret Mary Alacoque, a nun in France in the seventeenth century. She did indeed call for such a feast. But she didn’t make it up. Devotion to the Sacred Heart was already important in the Middle Ages. And the Church didn’t accept it merely because Margaret Mary said so. It was providing insight into the needs of the time – more on that in a minute. This doesn’t mean Margaret Mary is bad or unimportant – in fact, it points out that Margaret Mary had both a great grasp of the Tradition and an inspired eye for the needs of her time. She is a great saint – but she is a great saint because she was not suggesting wild ideas. Similarly, St. Faustina has important insights that we should hear. But those insights are important not because she made them up, but because she didn’t. And the Church’s articulation of those insights take them beyond St. Faustina, into the teaching of the Church. Divine Mercy is the Church’s feast, not just St. Faustina’s. That’s why St. Faustina is a saint: because she preaches the Catholic truth. Now, there is reason to be hesitant about the Divine Mercy devotion, if not rightly understood. The key problem is abstraction. Divine Mercy has in many ways supplanted devotion to the Sacred Heart. But the Sacred Heart focused on the person of Jesus, particularly the union between his divinity and humanity. Devotion to the Sacred Heart is not abstract, it is personal and it is intensely incarnational. Divine Mercy, by itself, runs the risk of becoming an abstraction. To be specific, the danger is that “mercy,” apart from Christ, can lead us to think that our conversion doesn’t matter. People tend to think that mercy means God overlooks our sins. To the contrary, God’s mercy is in healing us and converting us. The Sacred Heart, being so intensely human, reminds us that God’s mercy restores our humanity. It reminds us of the need to love. It reminds us of the humanity of Jesus, and of his virtues. We pray, “make our hearts like unto thine” – which is the right understanding of mercy, the opposite of God just overlooking our sin. It is important that our devotion to Divine Mercy maintain this incarnational, human element. St. Faustina, of course, helps us. 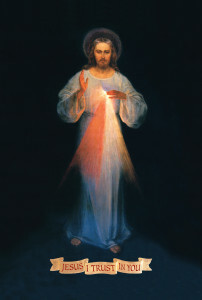 Her image of Divine Mercy (above) shows that Divine Mercy is a commentary on the Sacred Heart, and on the sacraments – not a replacement for them. In the image, Jesus does not overlook us, he looks intently on us – and the sacraments pour forth from his Sacred Heart to heal our sins and unite us to his glory. And underlining it all are the words, “Jesus I trust in you.” St. Faustina does not let us turn Divine Mercy into an abstraction. It is another insight into the Sacred Heart of Jesus. So too the Mass that the Church gives us. 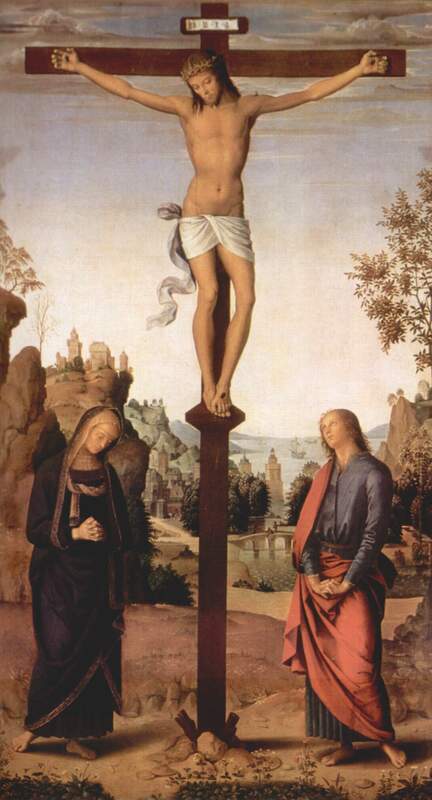 The Feast is placed on the octave of Easter Sunday. As Pope Francis has said, it is thereby “dedicated to the glorious wounds of the risen Jesus.” Like the image, it points us not into abstraction but into Easter. The Divine Mercy comes to us through the sacraments of the Sacred Heart of Jesus. Mercy is no abstraction, it is union with Christ, crucified and alive. What does the Heart of Christ teach you about Divine Mercy? After the hectic end of a hectic school year, I return to this website. 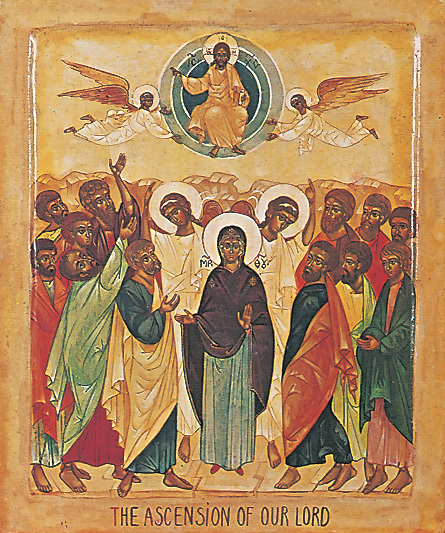 Last Sunday (or, some places, the Thursday before) we celebrated the feast of the Ascension. It is in a sense the culmination of the Easter season. The whole Easter season is the passage from the Resurrection of Christ, the firstfruits, to Pentecost, in which the power of Christ is given to his Church. This is the whole Christian mystery: the power of Christ is given over to his body, the Church. The first reading, the beginning of of the Acts of the Apostles, has three key moments. First, it says, “wait.” “Wait for the promise of the Father . . . in a few days you will be baptized with the Holy Spirit.” The waiting is key, because it manifests that the power is not theirs, but his. It is not that the Church is automatically holy – our holiness is a gift from Christ. At that first Pentecost and again and again in our lives, Christ makes us wait, to experience that it is a gift. And third, it says he “will return” – “in the same way as you have seen him going into heaven.” It is another variation on the “waiting.” We wait for his fullness, wait for his kingdom, wait to see him face to face – but as we wait, his power is at work in us, to build up a worldwide Church that longs for him. The first thing to know is that the first generations actually did these things. In Acts 28, for example, “when Paul had gathered a bundle of sticks, and laid them on the fire, there came a viper out of the heat, and fastened on his hand . . . . he should have swollen, or fallen dead suddenly: but after they looked a great while, and saw no harm come to him, they changed their minds, and said that he was a god” (Acts 28:3, 6). God manifests his spiritual power in physical ways: shows the resurrection of the soul through the resurrection of the body, the giving of the Spirit through physical flames, the power of his witnesses through miracles of serpents and deadly drinks. These aren’t the point, and so they don’t always happen, but they do serve to show the reality of his power. But these things point to our spiritual gifts. We may not be bitten by physical vipers, but the world attacks us in many ways – and the power of Christ, only the power of Christ, lets us pass through unharmed. We are given many poisoned cups; the world often tries to kill us; but through the power of Christ, and only through his power, we are saved. These signs make clear to us that it is not our cleverness – no cleverness can save you from physical poison, and no cleverness can save you from spiritual poison. But Christ is in us. That’s the point! The readings are too rich, and we have not the space to consider the readings (there are a couple options) from Ephesians, Paul’s fabulous letter on the spiritual nature of the Church. Let us only say: it is the Spirit of Christ who builds the Church. The Spirit who saves us from poison also builds up the faith, the various ministries which give us hope, and the unity in love which is the Church. This is no natural body, but the power of Christ at work in us who believe. How is Christ calling you to “wait” for his power to descend on you? As we continue through Easter, we move deeper into the risen Christ’s presence in his Church. This week’s reading have an interesting back-and-forth between words and deeds. We are moving towards Ordinary Time, toward the time after the Ascension: the life of the Church once Christ has gone to heaven. How does Christ continue to live in his Church? We will find, as Easter launches us into Ordinary Time, that Christ dwells in his Church especially through his words. Now, I have taught and meditated on First John for years, and honestly, it’s not clear me what he means by Christ’s commandments. I’m certain he thinks that the “new commandment” (that’s an idea John gives us in his Gospel) never contradicts the “old commandments,” the Ten Commandments. Jesus’s command to love as he loved includes – among many other things – never breaking the Old Law. But whether John wants us to think about the Old Law or only about the New, I don’t know. In any case, we must obey the commandment to “love one another” and we must “believe in the name.” It is his words, about himself and about our neighbor, that transform our deeds. We must let his words be active in us. For us, the point is that he has to prove his sincerity to them. That requires more than words, it requires deeds. But Paul’s most powerful deeds are his words: his willingness to speak out, to witness to Christ. It’s “words not deeds,” in the sense that he doesn’ft just say, “trust me,” he shows them they can trust him. But he shows them through the boldness with which he speaks of Jesus. This is important: the word is living and active, sharper than any two-edged sword. Consider the commandments: they are important because those words prune our actions, they point out what we don’t see. How do we get past our impressions, our feelings, our fallen, misguided, unjust sense of justice, intemperate sense of temperance, imprudent sense of prudence? God speaks to us, and his word penetrates our darkness. His word prunes us, reminds us of the power of what is good, shows us the evil of what is bad. “If you abide in me, and my words abide in you,” he says in our Gospel, “ask for whatever you wish.” If his words abide in us, they will show us what to wish for, show us the power of prayer. But we need to cling to those words. They are powerful, they are the source of good deeds. Where is Scripture in your daily life? 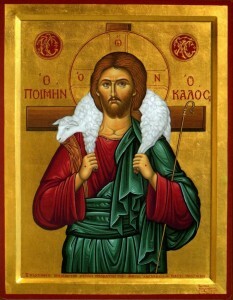 Every year on this Fourth Sunday, halfway through Easter, we read from the tenth chapter of John, on the Good Shepherd. We continue our meditation on how Jesus’s resurrection penetrates into our lives. The readings this week focus on the power of faith. In Acts, the authorities ask Peter, “by what power or by what name do you do this?” The discussion, we learn, is about a healing. Peter talks about the power of healing, and says “this man is standing before you in good health by the name of Jesus Christ of Nazareth.” He concludes, “There is salvation in no one else, for there is no other name under heaven given among men by which we must be saved.” The power of salvation is by the name of Jesus. The power goes with the name. The Gospel reading takes up the same theme, though less obviously. 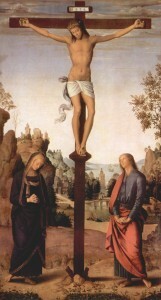 Jesus says, “I lay down my life and take it up again,” then emphasizes his power: “I have power to lay it down, and I have power to take it up again.” Here he doesn’t talk about the “name” but he does talk about personal knowledge: “I know my own and my own know me, just as the Father knows me and I know the Father.” We enter into the power of Jesus: the power of his resurrection, by which he enters into our death so that we can enter into his resurrection. And we enter in by knowing him. This (says St. Thomas Aquinas) is what all the business about the “name” really means: we know him. We recognize him. In the Bible, sheep are not stupid. Sheep are the one kind of herd animal that don’t have to be beaten and driven, but follow after their shepherd, because they know him and trust him. They are like dogs, which we consider for that reason to be smart. But unlike dogs, sheep also flock together. That is the image of the Christian: he finds himself in the Church, the flock who know and trust and follow the Good Shepherd. They are joined together by the name of Jesus. In Year B of the Lectionary, we spend Easter in John’s magnificent First Letter. The reading this Sunday is short but potent, and beautiful. Again the theme is knowledge and power, the name and the reality. “See what love the Father has given us, that we should be called” – receive the name – “children of God; and that is what we are.” Indeed, the name we receive is the name of Jesus: Son of God. The fabulous thing is that he has the power to make it so. “The reason the world does not know us is that it did not know him.” It is all rooted in knowledge – not obscure textbook knowledge, but personal knowledge, knowing the Father, knowing the Son, knowing the person, knowing them by name. “When he is revealed,” when we finally know him fully, “we will be like him, for we will see him as he is.” How do we receive the power of Christ? By seeing him, knowing him. Now we see dimly, by faith – and already we are transformed. The ultimate transformation will come through knowing him fully. The reading from Acts and the Psalm use another metaphor: “the stone which the builders rejected has become the cornerstone.” Corner sounds like the bottom, but in both the New Testament Greek and the Old Testament Hebrew it’s literally “the head of the angle.” This is the keystone of the arch, the piece without which the structure collapses. And the focus is so beautifully on knowing the cornerstone. Human wisdom has chosen the wrong support, the wrong way of building. Only when we know Christ can we stand. (And notice, again: like the sheep, the stones stand or fall together, in the Church.) And so, “There is salvation in no one else, for there is no other name.” If we do not know him, recognize him, it all collapses. First: John stakes everything on the Trinity. God himself is the eternal mystery of knowing and being known, of persons in communion. That is what we enter into when we know and are known by Christ: the eternal love of Father and Son – a love that knows. Second: we know as we are known. We look at him and he looks at us. He knows his sheep by name, just as we know him. Easter is the power of Resurrection. But it is a power that we enter into through the name: we love him as we know him. Let me only add that this is the power of Scripture, and of the rosary: to gaze on Jesus, to know him more deeply, to speak his name. What could you do to know Jesus better? Each of last Sunday’s three readings juxtaposes the same three apparently unrelated ideas: Jesus as the fulfillment of the Old Testament, his bodily nature, and repentance. To see the connection is to see deep into the heart of Christianity. Let us recall where we are. It is the third Sunday of Easter. 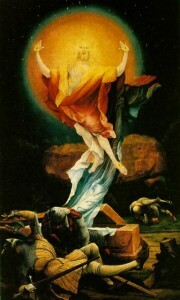 The previous Sunday was still the Easter Octave: the direct celebration of Christ rising from the dead. During the Octave, the Gospel readings are the same every year: last Sunday was Doubting Thomas. This Sunday, the third, is the last one in which we read stories about the Resurrection, though now the three years break up, to pick up the remaining stories from Luke and John. After this Sunday, on the Fourth Sunday we read different sections of John 10, the Good Shepherd; then on the Fifth, Sixth, and Seventh we read selections from Jesus’s priestly prayer, John 13-17. Easter is the season of Christ’s resurrection. But it is also the season of understanding the impact of the resurrection, its meaning for us. Throughout the season we read the Acts of the Apostles. Acts has been called the Gospel of the Holy Spirit: in it we see the disciples filled with the power of the Spirit of Christ. The pattern of his life is repeated in theirs; his strength is present in their weakness. His resurrection bears fruit in their transformation. That is why in the next weeks we will read about Jesus the Good Shepherd and his prayer for the Church: when we celebrate the power of the Resurrection, we celebrate Christ’s power for us. The resurrection is present in our lives. And so this past Sunday we once more read about the power of God in the resurrection of Christ – and his power in the Church. Our reading from Luke’s Gospel was the story following the road to Emmaus. At first glance it seems a bit of a catch-all. Jesus appears and again says “Peace be with you.” He proclaims the physical reality of the Resurrection: “Touch me and see; for a ghost does not have flesh and bones”; he even eats some fish. Again he reads the Bible to them: “‘everything written about me in the law of Moses, the prophets, and the psalms must be fulfilled.’ Then he opened their minds to understand the scriptures.” And he concludes by telling them “that repentance and forgiveness of sins is to be proclaimed in his name.” What a jumble of themes! The physical reality of Christ, repentance, the Bible. Perhaps it is easiest to see the connection between the first two. It points in two directions. First, Christ is no ghost; Christ’s religion is no ghostly religion. To love Christ is to love him in the flesh; to reject Christ in our flesh is to reject Christ. The Christ who dies in the flesh and rises in the flesh calls us to a faith-hope-love that takes flesh. Even more importantly, he comes to help us in the flesh. He who can raise the body can raise our bodies; he who enters into human life in Christ can enter into our human life. The grace of Christ is grace that enters not just into our ideas, but into our lives. The Spirit who raises Christ from the dead is powerful enough to raise us up to righteousness in the flesh. It’s not primarily what we do for him, but what he does for us: and he comes into human flesh, to give new life, moral resurrection. Repentance is the fruit of the Resurrection. But this takes flesh, even more, in the Bible. God speaks to us in human words, calls to us not just vaguely, like a ghost, but concretely. He speaks commandments – of many kinds: every line of the Bible is a kind of commandment. His word enters in. His word speaks specifically, calls us to a conversion that is not just in general, but specific, concrete. The God who takes flesh in Christ also takes flesh in his Word of Scripture, to enter in and call us to a very tangible, specific, real repentance. Does your faith ever get a bit vague? How could you use the Bible to make it more concrete? This Sunday, by decree of St. John Paul II, is Divine Mercy Sunday. It is obviously a time to think about God’s mercy. But let us truly think about it. Let us think especially about why this, of all Sundays, should be the celebration of mercy. This Sunday used to be called “Low Sunday,” or “Sunday of putting off the White” (garments): both references to it being the end of the Easter octave. In short, this new feast urges us to think of mercy in terms of Easter, as the culmination of Easter. It is not a Friday feast, not particularly focused on Christ’s death. It is a resurrection feast. Indeed, this is the rare feast that does not get its own readings: the readings are unchanged from when this was merely the octave of Easter – indeed, basically the same as they were even before Vatican II. Divine Mercy Sunday does not replace the old Octave of Easter, it is just a new name for the old celebration. Why? The readings are (and always have been) heavy on John. The first reading is from Acts, but the second is from the First Letter of John, and the Gospel is John. The Gospel is Doubting Thomas. First Jesus brings peace and the mission of reconciliation to the Apostles, on Easter Sunday. But Thomas is not there on Easter, so the next Sunday, Jesus appears again, for Thomas. Divine Mercy Sunday is first of all Doubting Thomas Sunday. Thomas says, “Unless I see . . . and put my fingers . . . I will not believe.” When Jesus appears he says, “Do not be unbelieving, but believe,” and then “Have you come to believe because you have seen me? And in the Epistle, John says, “Everyone who believes that Jesus is the Christ is begotten by God.” “Who indeed is the victor over the world but the one who believes that Jesus is the Son of God?” Believe! Like Paul, but in his own key, John is very insistent on salvation by faith. And so, says John, the “power to become children of God” is given “to those who believe in his name”: who trust in Jesus (Jesus I trust in you!) to do what we cannot do. This is Jesus’s double mercy to Thomas: to reach out to him to nurture faith, and then by that faith to give him new life. It is only his mercy, only their trust in him, that takes them from fear to powerful witness. They believe in his name, and he gives them his peace: there is no other way. This is the mercy of Easter, the mercy of rebirth in Christ, the mercy of rebirth through faith. Where is Jesus calling us to trust more deeply in the power of his resurrection?